Night Navigation opens on a freezing-rain night in upstate New York: the kindling gone, the fire in the woodstove out. Del’s thirty-seven-year-old manic-depressive son needs a ride, but she’s afraid to make the long drive north to the only detox that has a bed. Through the four seasons, Night Navigation takes us into the deranged, darkly humorous world of the addict–from break-your-arm dealers, to boot-camp rehabs, to Rumi-quoting NA sponsors. Al-Anon tells Del to “let go”; NAMI tells her to “hang on.” Mark cannot find a way to live in this world. Del cannot stop trying to rescue him. Through the four seasons, Night Navigation takes us into the deranged, darkly humorous world of the addict–from break-your-arm dealers, to boot-camp rehabs, to Rumi-quoting NA sponsors. Al-Anon tells Del to “let go”; NAMI tells her to “hang on.” Mark cannot find a way to live in this world. Del cannot stop trying to rescue him. And yet, during this long year’s night, through relapse and despair, they see flare-ups of hope as Mark and Del fitfully, painfully try to steer toward the light. Told in the alternating voices of an addict and his mother, this riveting novel adds new depths to our understanding and our literature of parents and their troubled children. 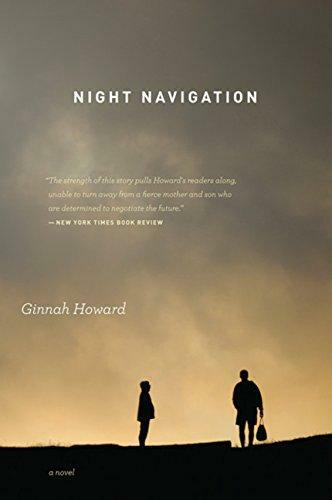 Ginnah Howard taught high school English for twenty-seven years and began writing when she was in her mid-forties. Her work has appeared in Water-Stone Review, Permafrost, and A Room of One’s Own, and has twice been nominated for a Pushcart Prize. A central paradox in Night Navigation is summed up in the quote “Al-Anon tells Del to ‘let go’ and NAMI [the National Alliance on Mental Illness] tells her to ‘hang on.’” How does Mark’s bipolar disorder complicate Del’s responses to his addiction? As a parent, how might you have handled the dilemma? In what ways do the deaths of Mark’s father, Lee, and his brother, Aaron, complicate Del’s decision-making process? Do you think that mental illness, substance abuse, and suicide can be linked to genetic biochemical disorders in the brain? Or are the environment and kinds of nurturing we receive stronger factors? How much can Mark’s emotional development be attributed to the deaths of his father and brother? Mark’s manic states appear to be episodic. He tells his counselor, Ben Jacobs, “No meds. No meds again ever . . . Land of the Living Dead.” What are some of the side effects of mood stabilizers and antipsychotic medications? What do you think of Mark’s decision not to use medications? Some readers see Del as a loving mother who can’t help but keep trying to save her son, especially during a psychotic break; others see her as a codependent enabler whose continual rescues prevent her son from living with and learning from the consequences of his drug use. What’s your take on Del? Is your opinion of her based on your own experiences or observations of the addicted or mentally ill? Mark is a similarly complex character. In light of particular incidents and choices he makes, do you think his negative traits outweigh his positive ones? Why or why not? How would you describe Richard Larson, Del’s longtime partner? How would Richard have dealt with Mark if Mark had been his son? Mark goes through numerous drug treatment programs: the detox unit in Camden; the upscale MICA unit at New Vistas; Lazarus House, a more confrontational therapeutic community; Narcotics Anonymous; and others. Mark’s pattern of repeated relapses indicates just how difficult it is to deal with someone who has a dual diagnosis. Could these programs have been more effective? How? What role does the Merricks’ dog, Luke, play in Night Navigation? How does the author use Luke to enliven some of the scenes with Mark? Night Navigation alternates between the mother’s and the son’s points of view. Why did the author choose this narrative structure? Did this technique work for you? Can you imagine a different structure? Mark frequently writes in sentence fragments. What was your initial reaction to that? Did it change as you read further? How important are the landscape and environment of upstate New York in evoking the world of the novel? How would you describe that world? In what ways does it differ from an urban or suburban setting in terms of the mood of the novel? Why did the author choose the title Night Navigation? What are some of the ways the title is used metaphorically? How might bats tie into that metaphor? How do bats represent mother-child themes? How does the horseshoe crab fit into those themes? Consider the final scene, in which Del and Mark are on the beach in Crystal Key observing the horseshoe crabs coming in to lay their eggs. Do you feel hopeful that Mark has made gains in the long process of recovery? Has Del started to let go? What do you imagine happens next?